Today we have a fun giveaway for you from our sponsor, Goliath Games! 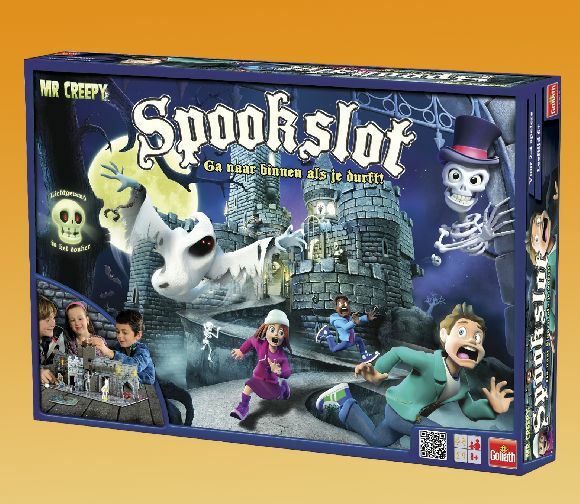 They are offering 3 lucky readers a Mr. Creepy Spookslot Halloween board game. Tired of carving pumpkins and trick or treating? Mr. Creepy's Spookslot Halloween board game is perfect for any sleepover or campout, but can also be played with the entire family. It's a question of life and death: players walk through torture chambers, cemeteries and haunted rooms and try to avoid being caught by the evil tree, the axe and the rolling skull. Mr. Creepy's Spookslot is the perfect Halloween board game promoting not only goosebumps, but also 20 to 40 minutes of creepy fun! For 2 to 4 players. To enter to win, please leave a comment on this post telling us why you want to win this Halloween board game. You can gain extra entries by sharing this post on Twitter, Facebook, Pinterest, Tumblr, StumbleUpon, Reddit and/or Google+ or by following this blog on GFC, Facebook, Twitter, Pinterest or Google+. The more you share and follow, the more you'll increase your winning chances. Leave a separate comment for each action you took, so I can count it accordingly. Open worldwide. Giveaway ends October 25. Pick me! Pick me!! My entire family LOOOOVES Halloween and playing board games together. This would be so much fun to play all year round. Fingers crossed. Ik ken Spookslot vooral als een attractie van De Efteling. Is er een verband tussen dit Halloween spel en De Efteling? In dat geval, zou ik graag het spel winnen. Ik heb getwitterd over Spookslot. Ik heb op Facebook gepost over Spookslot. Always looking for ways to entertain the kids! This game looks like a lot of fun! Thank you for sharing this giveaway with us! Spookslot ziet er een grappig spelletje uit. Volgens mij kunnen kinderen zich hier prima mee vermaken. My son a nephew would love to play this together, it is right up there ally. Who does not dream of Halloween with such a game! Seems like a good choice for the post-Halloween party for the Twin Cities Board Game Meetup. I'd like to win this because we usually stay in and play games on Halloween. i have never seen a halloween game before my family would love to play this. I'd like to win because Halloween is our biggest holiday as a family, and this would just top off the night! Halloween is my favorite holiday and THIS looks spectacular! This giveaway is epic. I love halloween board games, always have! i love board games so i would love this plus i have a fall birthday so it's perfect when i have parties! My son loves games and Halloween. loves the ghosts and monsters and would love this game. My family loves board games and Halloween so this game was made for us. Because I love Halloween and this looks like it would be fun to play on Halloween night! my family loves board games and we'd like to add to our collection! This looks fun, I'd love to win! would love to win this for my niece & nephew...they would love it! I would love to win because my granddaughter loves board games, and this looks like one she could have fun with! I am crazy for Halloween but I have never had a Halloween Board Game! I would love to win and add this to my Halloween collections! I and my family love board games, their always better then any computer games. Board games are also a great way to spend quality time as a family. I posted & shared on Twitter! I posted & shared on facebook! Started following you on Twitter! Is dit een heruitgave van een oud Halloween bordspel? My family loves board games and could make this one a yearly tradition! My family loves doing things together and making new traditions. this would be so fun to play and start a new family game night tradition! My family loves halloween including my two boys. This would be so awesome to play together! I would love to win this because we don't go trick or treating, but have a night of games and scary movies instead. This would be perfect for my younger boys!! Wat een leuke give-away, gaaf spel lijkt me dit om te spelen met de familie in de komende wintermaanden! :) Ik hou sowieso wel van bordspelletjes (en halloween), haha. Keep my fingers crossed! xxxx Kiek. Ik volg je via Pinterest! Ik heb deze post ook op facebook gedeeld! En ook op pinterest gedeeld. I would love to win because my whole family LOVES halloween! Met halloween heb ik proefwerkweek, dus ik kan het niet vieren, kan nergens naartoe ofzo. Als je dan een spelletje kan spelen tussen het leren door is dat leuk! Bovendien vind ik dat er in Europa meer halloween gevierd moet worden! I want to win this really bad! This reminds me a lot of a board game I had as a kid and I would LOVE to play it with my daughters! I follow via GFC as Katie Amanda. I'd like to play this game with my students. I follow via twitter as katieamanda2. I follow via google + as Katie Amanda. I've never seen a Halloween board game before. I was looking for something to do at our Halloween party to keep the kids entertained and this seems like it could be just the ticket. I would like to win because its a board game that the whole family can enjoy! We would have alot of fun playing this together. This game looks awesome; I'd love to check it out! I would like to win the game because it's hard to find a game that's good for the whole family and not just the kids. kristiedonelson(at)gmail(dot)com Thank you. Follow on GFC. Kristie Donelson. kristiedonelson(at)gmail(dot)com Thank you. Follow on Twitter. @kdonelson kristiedonelson(at)gmail(dot)com Thank you. Like you on Facebook. Kristie Morrison Donelson. kristiedonelson(at)gmail(dot)com Thank you. I want to win this because we love Halloween and we have a weekly "family night" each Saturday where we eat junk food and play board games and catch up with each other. Thanks for the chance! Halloween is one of our favorite holidays, we'd love to win this game simply to add it to our list of games for Family game night! I want to win b/c I think my daughter would like it. My family loves Halloween and board games! Thanks for the chance! I would LOVE to win this board game. I think it would be lots of fun to play before and after trick or treating and all through the season! My kids would LOVE this!